Sundance & Star, signed Tim Cotterill Frogman Matching Pair. 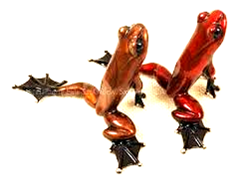 A shining pair of stunning solid bronze frog sculptures by the world's biggest selling bronze artist Tim Cotterill. Perfectly posed to go together, the charming Sundance & Star compliment each other beautifully. Dimensions of each 5.5" x 4.5" x 3.5"